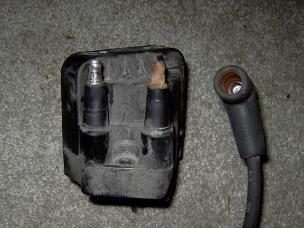 I have a Chevy Malibu 1999, my ignition coil is misfiring I am pretty sure because it rained pretty hard last night. My check engine light will flash and my car will start chugging/shaking… but once I accelerate it doesn’t shake. Sometimes the light will just be on and other times it will be flashing. Is it okay to drive for a day or so before I get it fixed and do you think that is what the problem might be? You can drive it like that yes, but I would drive it as little as possible until you can get it fixed. Since moisture seems to affect it, I would say you either have a spark plug wire that is misfiring, or a bad coil. To check for sure, you can spray around the coil packs and wires with a water spray bottle and watch for it to act up, or listen for the arcing spark. Okay, thank you! It has done this before last summer, usually when it rained as well but it most of the time was okay the next morning, or the next day by afternoon. Do you think it could possibly go away tomorrow if it dries out from the rain last night? If it’s dry enough, sure. Alright, thank you for your help! How do i fix the body control module on a 2001 Chevy Malibu. I assume you mean replace the body control module? Yes how do i do this and where can i buy this part? Well there is good and bad to that. You can get the part at any GM dealership, and to install it is fairly easy. It is located under the right side of the dash, you just have to remove the trim panel under the right side to replace the BCM. The bad news is that it has to be programmed and set-up to your particular car. Only a dealership can do this. Do you know how much this would cost roughly. If you had the dealership install the part and program it, it should cost no more than about $400. That is including the price of the part. 2 Comments on "1999 Chevrolet Malibu Check Engine Light Flashing And BCM Replacement"
I have a 1997 Chevy malibu I’ve had the check engine light on for some time today I took my car out to get gas in it and it had been sitting for about a mouth and my check engine light started to flash didt see how many times it flashed before it stopped and it was running a little rough and it has died in a parking lot while just sitting after i reved up the rpms just to make sure it was still on not sure whats causeing this maybe a tune up is needed?